? *USE ONLY FOR PC & LAPTOPS ? The Navistar? 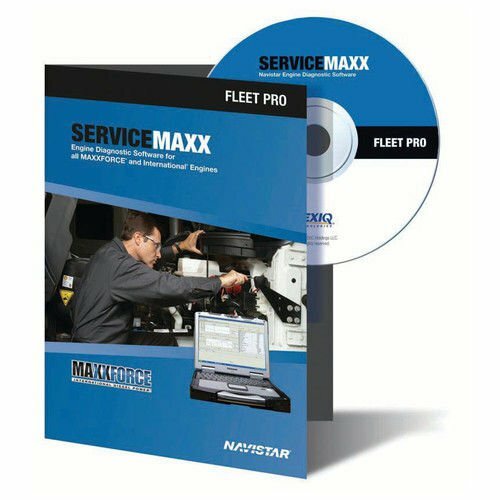 SERVICEMAXX application is a fully-featured PC application designed to meet the wide range of diagnostic challenges you face when servicing a mixed truck fleet. ? Coverage includes all International electronic engine systems, allowing you to run special tests, change parameters, and view and graph engine data. ? This is the top-of-the-line tool for fleets. ? Basic Functions ? Read Fault and clear diagnostic fault codes ? View, graph and save engine data ? Advanced Features ? Diagnostic Tests ? KOEO ? Key On Engine Off ? KOER ? Key On Engine Running ? KOEO ? Injector Buzz Test ? KOER ? Injector Contribution Test ? Cylinder Cutout Test (EPA 04' and newer) ? Injector Disable Tests (EPA 04' and newer) ? Display and change configurable Parameters ? Crank Inhibit ? Fan Control ? Idle Shutdown Timer ? Warm-up Device ? Warning and Protection System ? Hydraulic Pressure Governor ? PTO Control ? Radiator Shutter ? Vehicle Speed Limit ? Vehicle Retarder ? Two Speed Axle ? If you have any questions about this product by MP.S, contact us by completing and submitting the form below. If you are looking for a specif part number, please include it with your message.